Apr. 1976 Entered the Basic Research Laboratories, Toray Ind., Inc.
Apr. 1997 Deputy Director, Basic Research Laboratories, Toray Ind., Inc.
Apr. 2001 Director, Medical Research Center, Toray Ind., Inc. Although opium analogs (opioids), represented by morphine, have a strong analgesic action and other distinguished pharmacological actions, they have been used for late-stage cancer pain and other limited applications because of their side effects, such as drug dependence. Dr. Hiroshi Nagase, who focused attention on the fact that there are three types of receptors (μ, δ, κ) in opioids in the cell surface, succeeded in finding the method for avoiding the binding of μ receptors, which is the cause of drug dependence, and, at the same time, developing antagonists with high selectivity for each of δ and κ receptors (drug that binds itself to receptors to suppress the activity of agonist) and selective agonists to κ receptor (drug that bind itself receptors to show the activity). Nalfurafine, which is an agonist for κ receptor, in particular, was the first drug in the world without drug dependence, and drug aversive effect like hallucination, and auditory hallucination. Nalfurafine is very effective in alleviating itching and has released many kidney dialysis patients from intolerable pruritus. Dr. Nagase also found out that the selective drugs for the opioid receptor types have a variety of pharmacological actions, such as antitussive, antidepressant, anxiolytic, anti-pollakiuria, antimalarial, and anticancer effects, and is cultivating a new area for new opioid drug without dependence and aversion. Due to the aforesaid reasons, Dr. Nagase will be an awardee of the 14th Yamazaki-Teiichi Prize in biological science & technology. Although opioids, represented by morphine, have a strong analgesic action and other distinguished pharmacological actions, they have been used for limited applications because of their serious side effects, such as drug dependence. Recently, however, it has been revealed that there are three types of opioid receptors (μ, δ, κ), and an agonist or antagonist with high selectivity has been required for each type of receptor because of the necessity to study the pharmacological actions of these three receptor types. Professor Portoghese, ahead of other researchers, synthesized β-FNA, which is the irreversible μ receptor antagonist, and reported, as a result of the use of this antagonist, that drug dependence was attributed to the μ receptor. This report triggered fierce competition in the creation of a κ agonist in pursuit of a dream analgesic. 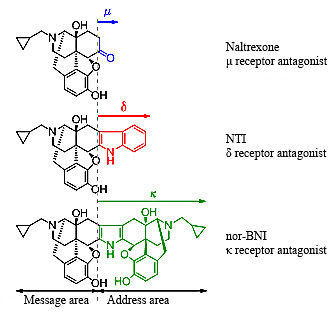 At that time, I successfully synthesized a κ antagonist, nor-BNI, and δ antagonist NTI based on the basic structure of naltrexone and applying the message-address concept in collaboration with Professor Portoghese. Full-scale research in the three types of opioids began all over the world, using these antagonists and the μ antagonist β discovered by Professor Portoghese (Figure 1). On the other hand, subtypes of the δ receptors were also proposed, and I also succeeded in synthesizing antagonists for these subtypes (δ1: BNTX, δ2: NTB). Competition in the development of κ agonists traces back to the report of the world's first κ selective agonist, U-50488H, by Upjohn. 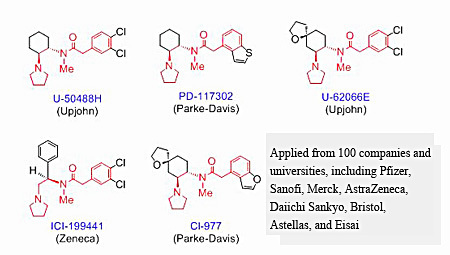 That is, pharmaceutical companies in the world developed compounds imitating the structure of this U-50488H and heated up competition (Figure 2). Although these U-50488H-type drugs yielded the great results of the confirmation of analgesic actions and the separation of dependence, they showed serious drug aversion (actions represented by hallucination and auditory hallucination). The types of drugs shown in Figure 2 were dropped out at the initial stage of clinical trials. In the present research, I did not imitate the structure of Upjohn's agonist and designed and synthesized an agonist with novel structure. The accessory site theory was utilized for the design. To be specific, a antagonist has lipophilic site called an accessory site whereas an agonist has no the site and resulting in that the agonist has slim structure. Using this theory, I synthesized an agonist with a slim structure without the lipophilic site, and finally led to nalfurafine as a result of the optimization of the obtained agonists (Figure 3). Fortunately, this nalfurafine showed potent analgesic effect and became the first drug to succeed in separating both dependence and aversion. I further conducted clinical trial for application to postoperative pain, but the trial confirmed a serious sedative action (drowsiness, wobble ) at the dose which the analgesic effect was shown. For this reason, I gave up the application of nalfurafine to postoperative pain. For the abovementioned reason, I examined another application of nalfurafine, and obtained the information that kidney dialysis patients suffered from serious pruritus. I performed animal tests and clinical trial to determine whether nalfurafine was effective against it, and finally succeeded in releasing it on the market as a therapeutic drug for intractable pruritus. The κ agonists of competitors have still not been released to the market because of the serious aversion. This nalfurafine was also proven in a national project (“Research in the clarification of the mechanism of mental disorder induced by drug dependence”) with Professor Toshitaka Nabeshima (School of Medicine, Nagoya University) and Professor Tsutomu Suzuki (Hoshi University) that it was effective against to most of the addictive drugs, including methamphetamine, morphine, cocaine, and nicotine. In addition, it was also revealed that the inhibition of dopamine release in the nucleus accumbens led to inthis effect. Meanwhile, I also conducted in-depth research in δ receptor agonists, and designed and synthesized the highly selective δ receptor agonists TAN-67 and KNT-127, which were improved blood brain barrier permeability than the former, designed by removing the accessory site from the structure of NTI (Figure 4). Both of these agonists completely separated serious side effects (convulsion, catalepsy), which were the reasons why the development of another agonists of competitors could not succeed, and the KNT-127 showed activity more than 100 times higher than that of standard δ receptor agonists. In addition, I discovered another δ agonists with novel structures, and these compounds led us to find not only an analgesic effect, but antidepressant and anxiolytic effects, and anti pollakiuria Highly evaluated for its effects andthe usefulness, the present research is adopted for A-STEP (Adaptable and Seamless Technology Transfer Program through Target-driven R & D, seeds development type and high risk challenge type: both of them are joint researches with Nippon Chemiphar Co., Ltd.) of JST and still studied actively. The creation of the abovementioned antagonists later led me to the clarification of the precise pharmacological actions derived from the opioid receptor types (the epoch-making discovery that the δ and κ agonists, in particular, could separate drug dependence). I also found out the strong antitussive effect of NTI and further subjected it to clinical trial as an antitussive drug (TRK-851) free from drug dependence and having more than 100 times higher activity than that of codeine. In addition, I - found out that the δ1 antagonist BNTX had the releasing effect of the drug resistance of drug-resistant malaria and that the BNTX derivatives suppressed not only the growth of malaria but also the those of a wide variety of infectious protozoa. Interestingly, the mechanism of this drug resistance release leads to inhibition of not only glutathione itself but alsodrug efflux transporters, which may result in the inhibition of CD44. From this fact, it is expected that the δ1 antagonist will be the great first step toward the creation of therapeutic drugs against drug-resistant cancer. Because of their dependence liability, opioids were treated as narcotics long time, but by the research achievements by the applicants, their dependence liability can be separated today. This finding⁄discovery led to the new discovery that opioids have not only an analgesic action but also antitussive, antipruritic, antidepressant, anxiolytic, anti-pollakiuria, and antimalarial effects, the suppressive effect of the angiogenesis of cancer cells, and many other effects, and made a great contribution to the resolution of human health problems. Furthermore, the creation of nalfurafine helped us to clarify the mechanism of itching and find in collaboration with the University of Pittsburgh the reason why people scratch when they feel itchy.